Directions: In a large sauté pan, heat olive oil & melt butter. Then add shallots & butternut squash & sauté over low heat until tender, about 8-10 minutes. Stir occasionally; do not let shallots & butternut squash brown too much or burn. Also, it's very important to avoid crowding the pan: Be sure to spread out ingredients evenly across pan, so that they cook uniformly. Add hazelnuts & sage, & cook for another 2-3 minutes, or until sage has become slightly crisped/shriveled. Season with salt & pepper, add thyme & then water (to deglaze). Also add creamer at this point, if using. Cook for 10-15 more minutes, until liquid has reduced to a thin layer on the bottom of the pan. Stir occasionally to keep ingredients from sticking or burning. While sauce is cooking, make pasta: Bring medium-sized pot of lightly salted water to a boil and cook pasta until al dente, about 9-11 minutes. Remove from heat & drain. Transfer to colander, shock with cold water, & drain again. Divide pasta into 2 equal portions, transfer to bowls, & set aside. 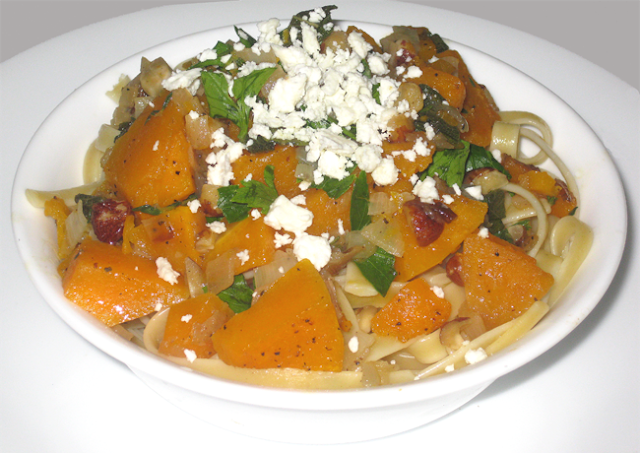 Variations: If you prefer, you can substitute goat cheese or freshly shredded or shaved Parmegiano-Reggiano cheese for the feta.